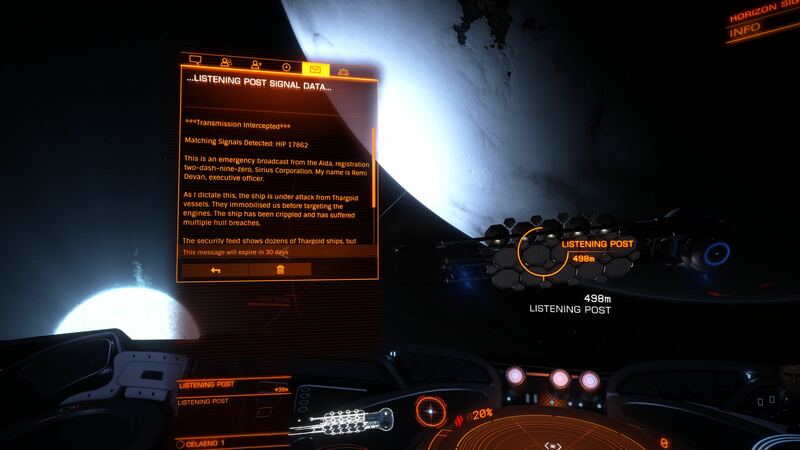 I know there was a relay station but a listening post ? A number of news feeds have reported the discovery of an intriguing message in the Celaeno system. The message, which was recovered from a listening post, apparently contains an emergency broadcast from the Aida, a Hogan–class cargo vessel. Yeah, but why this one appear in the galnet ? That message text is sooo broken! Off to HIP 17862 then! Wow, it talks about new Thargoid ships, probably the ones we've seen in the trailer? Ohh post some pics of you see new thargoids! Well, haven't found anything new yet. Neither the ship's wreckage, nor anything new in NHSS-es. Update: checked the vicinity of all the bodies twice, checked a bunch of signal sources, nothing. I wonder if it's better hidden, or just bugged. In any case, that's it for me, I do need to get going. Doh... I was in Celaeno only yesterday. Somewhere here, at a distance no more than 160 Ly. I had a good fly around all the planets in the system and found no new fixed signal sources (just the tourist beacon close to the 6th planet, because there's a crashed Thargoid Interceptor in this system). The news article mentions the ship sending the distress signal is a Hogan class Cargo vessel, so you'd think there's supposed to be a wrecked megaship somewhere. Frontier forgot to place the megaship ?